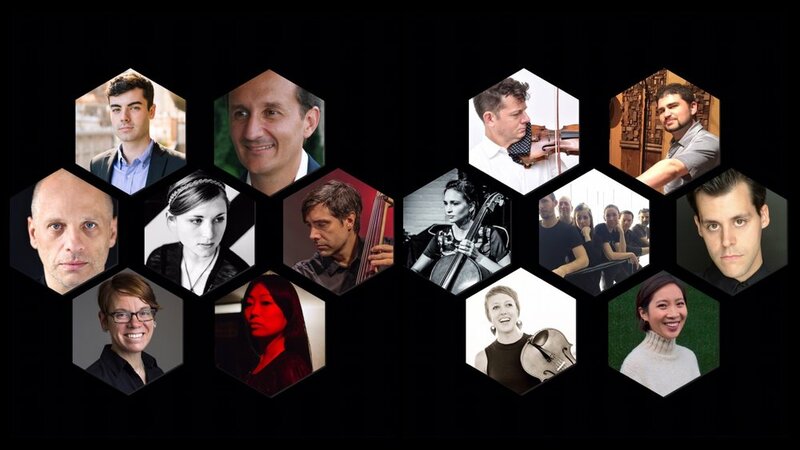 Carnegie Hill Concerts Chamber Players join composer, vocalist and multi-instrumentalist, Toby Driver, in an evening of innovative and virtuosic twenty-first-century chamber music, presenting a the full set of compositions from Toby Driver’s most recent album, They Are the Shield. “Toby Driver of maudlin of the Well and Kayo Dot (along with a slew of other projects) released his first solo album in over a decade just last year. What the excellent Madonnawhore began was a new dimension to the versatile songwriter’s avant-garde and forward-thinking music. It consisted of ghostly songs and a stripped down instrumental line-up, possessing a level of intimacy that was previously unexplored by Driver. His first solo album in over a decade could be considered his most straightforward release by embodying a consistent tone and style from beginning to end, which maudlin of the Well and Kayo Dot have avoided. They Are the Shieldexpands on the wistfulness of its predecessor for more complex and dynamic songwriting. Unique soundscapes come alive through an interplay of violins and sublime ambiance, particularly in album opener "Anamnesis Park." Nearly six minutes go by before the singing and main groove of the song even begins, but the violin and keyboard centric intro is so captivating and well-structured that it feels completely natural. The unconventional writing Driver is known for is at its strongest here, as it is in the best work by maudlin of the Well and Kayo Dot. Violins, guitars, and keyboards drift in and out of playing solo or layered together in a uniquely beautiful way. “Glyph” is a lush, sorrowful piece featuring one of Driver’s most impressive vocal performances. The track crescendos with a cinematic slow dance between achingly gorgeous violins and atmospheric guitar tones. Some moments on the first half sound faintly influenced by early Godspeed You! Black Emperor and later-day Talk Talk in rewarding fashion. “470 Nanometers” is a more energetic piece and an album highlight, reminiscent of the maudlin of the Well reunion album Part the Second, with dazzling guitar and violin playing and grooving drums. While retaining focus, They Are the Shield is able to explore a wide range of dynamics, from unsettling ambient sections to uptempo passages of a kind of undefined middle ground between chamber music and post-rock. Driver lets the influences of contemporary experimental groups and composers like Ulver and Max Richter seep in while making something wholly original. “Scaffold of Digital Snow” possesses a kind of mystique as it begins with solo violin and guitar chords, then transitions to a soaring middle section of stunning string arrangements with singing by Bridget Bellavia, the multi-talented collaborator with Driver on their dark electronic music project Piggy Black Cross. “The Knot” is an ambient ballad that closes the album on an emotional note, as the track builds to a stunning climax that shows the range of Driver’s singing voice and an ethereal blend of piano, violin, and synth tones. Everything is fluid, the only constant is change, you can't step in the same river twice. Many people hold these truths to be self-evident, and as these ideas become even more more commonplace, it only makes sense that musicians should defy the demand to answer the question "Who are you?" The refusal to answer is, in a way, the best answer possible. Toby Driver's music is what that refusal sounds like. Having grown up in the Northeast US, surrounded by a confusing combination of progressive social values and religious upbringing, haunted history's abandoned places and nowhere to stop the car even just to take a look, Driver developed an adventurous mind fascinated with exploration, rule breaking, and the unknown. Music was present since birth, through his parents' LP collection, and became a study at age eight following in his older brother's footsteps, whose mere 11-month age difference led to literally everything being shared. It was perhaps here that Driver's urge to discover his own self was stoked. He studied composition at the experimental school, Hampshire College, with the jazz legend Yusef Lateef, whose unorthodox and innovative artistic practices encouraged Driver's search to become even more vigorous, and he developed a style characterized by imposing architecture and a distinct approach to time, focusing on ensemble performances of grand conducted phrases and impressionistic pulse, strongly influenced by Lateef's sense of harmony–ideas which he later compressed into virtuosic and complex rhythmic counterpoint. Whereas most musicians identify themselves by their chosen genre, Driver's rejection of idioms has resulted in a vast, unpredictable discography full of risks and liberties that invokes influences from every age and place while never settling on one palette of colors, and a career that has brought his music to a considerable breadth of venues, from thousands-capacity metal festivals to classical concert halls, and from basement concerts to the 57th Biennale di Venezia. It is in retrospect then, where the fullest picture of Driver's mission comes into focus: the navigation of his own identity and purpose, the discovery of which aspects are fluid and which are inescapable, and the sustained repetitive insistence of a person's voice and personality passing through environments and time. Brian Chase is a drummer and composer living in Brooklyn. His diverse range of work includes that with Grammy nominated rock band Yeah Yeah Yeahs, the community of the New York experimental music scene, and Drums and Drones, an electroacoustic project focusing on the application of the just intonation tuning system to drums and percussion. Performances have taken him across the world to such notable stages as the Sydney Opera House, Reading and Leeds Festivals, and Metropolitan Museum of Art. Counted among these are innumerable DIY and independent art spaces of music’s “underground” communities. Recorded works include several with Yeah Yeah Yeahs and many albums with leading improvisors. In 2018, Brian released Drums and Drones: Decade, a triple album with 144 page book, covering the first ten years of Drums and Drones. This album was the debut release on his own label, Chaikin Records, which was followed by a duo album with saxophonist Catherine Sikora. 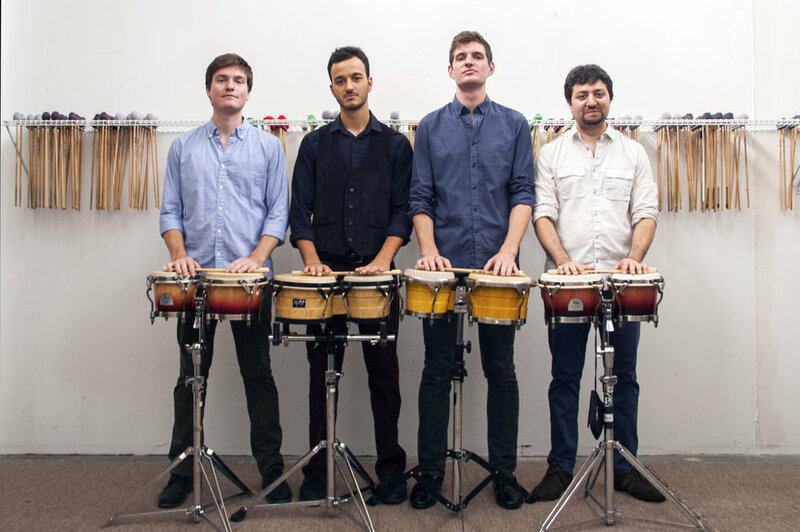 As an educator, Brian was a visiting professor at Bennington College and guest lecturer at So Percussion’s Summer Institute at Princeton University. Writings have appeared in John Zorn’s Arcana, Modern Drummer Magazine, and Talkhouse. Performer and artist residencies have been held at The Stone and Headlands Center for the Arts. Away from the drums, Brian is a regular practitioner of Ashtanga Yoga. 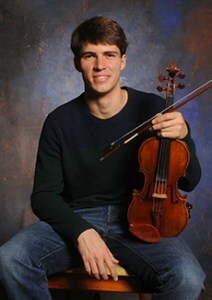 Violinist Conrad Harris has performed new works for violin at Ostrava Days, Darmstadt Ferrienkürse für Neue Musik, Gulbenkian Encounters of New Muisic, Radio France, Warsaw Autumn, and New York’s Sonic Boom Festival. In addition to being a member of the FLUX Quartet, he is concertmaster/soloist with the S.E.M Ensemble, Ostravská Banda, and STX Ensemble. He has performed and recorded with such artists as Elliott Sharp, "Blue" Gene Tyranny, Jean-Clause Risset, Rohan de Saram, and Tiny Tim. A solo CD featuring premiers by Alvin Lucier, David Behrman, Robert Ashley and Gordon Mumma will soon be released on Mode Records. He has also recorded for Asphodel, Vandenburg, CRI, and Vinyl Retentive Records. Pauline Kim Harris is a violinist and composer, prolific in the classical to the experimental/avant-garde. A frequent guest with New York City’s leading new music ensembles, she has also toured internationally with the Orpheus Chamber Orchestra. Pauline serves as Music Director of the Bill T. Jones/Arnie Zane Dance Company and has performed as violin soloist for choreographer Pam Tanowitz and David Parker of The Bang Group. As a curator, she co-produced Drawing Sounds II, with husband, Conrad Harris at the Drawing Center, Petr Kotik @75 at (le) poisson rouge and continues as co-curator of Carnegie Hill Concerts, a chamber music series committed to new music. 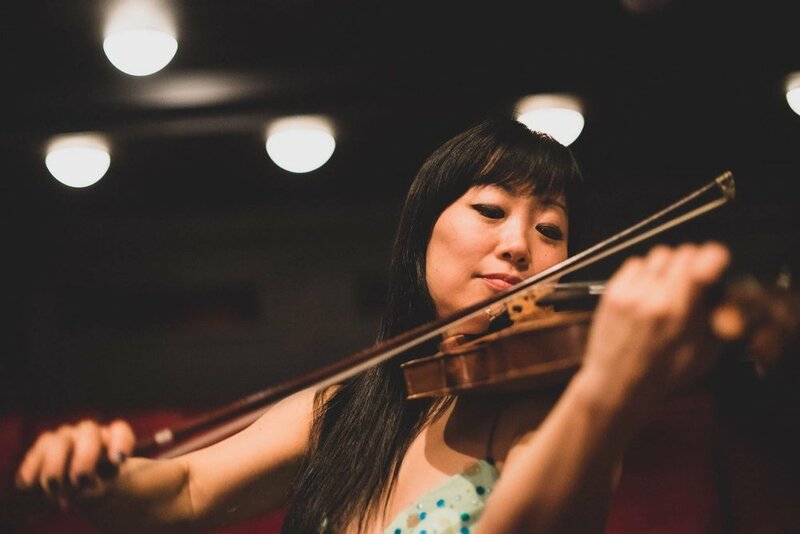 Her violin duo, String Noise released their freshman album The Book of Strange Positions on Northern Spy Records in 2015 and can also be heard on Dymaxion Groove Records, Cold Blue Music and more. Pauline has discovered an equal passion for composing as performing and is thrilled to be a resident fellow this spring at the Atlantic Center for the Arts. Commissioned by the St. George’s Choral Society her piece for organ, choir, cello and soprano, “When We Were” was premiered in 2016. She is currently making a new work for String Noise and Syrinx (acoustic synthesizer) "100 Thimbles in a Box" to be premiered on the Interpretations Series at Roulette on June 6, which will also include new works for String Noise by Sam Yulsman, Jessie Cox and George Lewis. A collection of even more new works will be presented July 9-13 on her first residency at The Stone and look out for her debut solo album on Sono Luminus Label later this summer. Fun fact: Pauline was in the final masterclass of Jascha Heifetz.